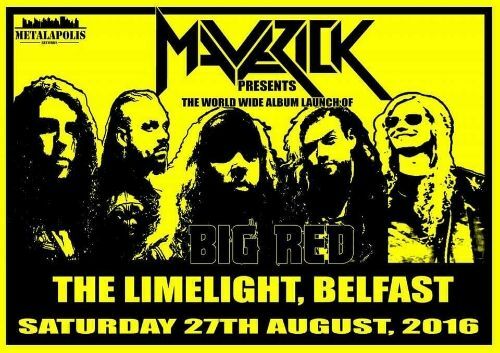 Local band Maverick release their second album “Big Red” on 26th August and have just unveiled a video for the first single from that album. 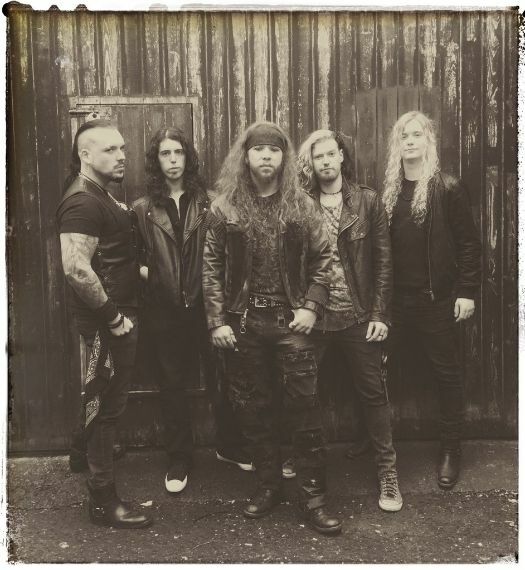 “Asylum” features guest appearances from guitarist Kane Roberts and The Poodles lead singer Jakob Samuel. I arranged to have a chat with Maverick’s lead singer David Balfour to talk about the new album and the band. You can hear that interview and four tracks from the new album on the Friday NI Rocks Show that was broadcast on 5th August. The Show is available now via the On Demand Player - http://www.rockradioni.co.uk/hosts/ni-rocks-friday-rock-show.html (the Show uploaded on 3rd Aug). The interview has been transcribed and posted in full below. NI ROCKS – Hi David. Thanks for taking some time to talk to Rock Radio NI. 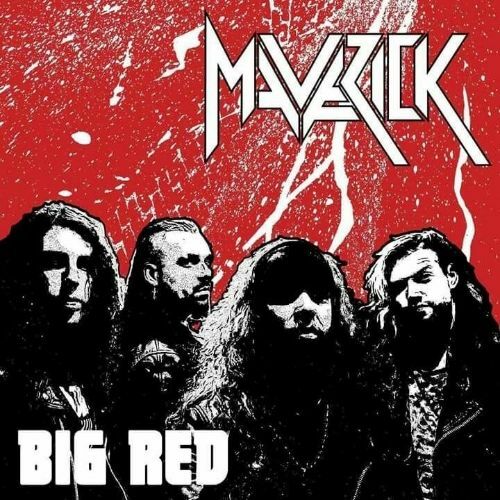 Maverick’s new album “Big Red” is released later this month. Can you tell us where it was recorded and who you worked with in regard to production etc. DAVID – Hi, thanks for having me, it’s a pleasure to be on the Show. The new album is called “Big Red” and we actually went back to the same place as we went for “Quid Pro Quo”. That’s with Neal Calderwood up at Manor Park Studio in Toome. It was second time around and we knew where we stood with Neal. I think we were used to each other so we didn’t have to do the feel out phase anymore. I think the process went even smoother this time. NI ROCKS – The new album is released by Metalapolis Records. How did you make the connection with them? DAVID – Our previous label Massacre had given us the contact name for a booker for the Poodles tour. We went with Thomas Kreidner who worked on the Wacken festival. We went out there and got in contact with the tour manager who was a man called Eddy Freiberger. There had been a few e-mails back and forward arranging the tour and when we went on tour we got on really well. We clicked immediately and he was a very professional guy, but at the same time he knew how to relate to bands. He’d been around the music business his whole life. He told us that he had a label that he and his friends ran called Metalapolis Records. After the first couple of times of him seeing us live, from the stage I can see everyone’s face and I noticed him and his friend Tom, the merch guy who is co-owner of the label, were chatting during our set. I thought either they’re bored or they like what they hear! Halfway through the tour they approached us and told us they thought we were a great band and they’d like to have us on the label. Although Massacre might have more of an instantly recognisable name, to Massacre we were just a number ; like band 85 out of a 100! But with Metalapolis, it’s a much more tight knit unit where everybody works to help each other out and I think it will be much better for the band in the long run. NI ROCKS – It’s been more than 18 months since the release of your debut album “Quid Pro Quo”. How would you compare the new album to that one? DAVID – Our first EP was a bit of a miss-mash but for “Quid” we were quite focused. At the time we were listening to a lot of Winger and stuff like that and I guess “Quid Pro Quo” very much reflected that. The new album still has plenty of that in it, but the songs wouldn’t have been as polished on “Quid”. I think that was a matter of timing. We’re still very proud of it as an album and it’s a good album, but this time around we took a more scientific approach and really beat the songs up and played them to death to make sure there were no filler segments. I think it’s a bit more of a polished, modern release. I think playing with The Poodles on the tour exposed us to what some of my friends would call Euro-rock, where the songs are a bit shorter and there is maybe more emphasis on the chorus and less on the music I guess. I think we tried to bring the positives out of that and it was just a natural progression for us. We wanted as much variety as possible and I think there’s more of that now than there was on “Quid”. Anybody who liked “Quid” will enjoy it, but it’s a step in a more modern rock direction. NI ROCKS – You’ve a couple of special guest appearances on the track “Asylum”. One is The Poodles vocalist Jakob Samuel and the other is former Alice Cooper guitarist Kane Roberts. You obviously knew Jakob from the tour with The Poodles last year, but how did you manage to get Kane Roberts on board? DAVID – With Kane, it all started with me and my brother hassling him with messages on Facebook. We’re big fans of his “Saints and Sinners” album. Just the standard “hey Kane thanks for accepting me, love the album” etc and he would give the obligatory “thanks very much”. We didn’t want to annoy the guy. Then my brother sent him the video for “Paint By Numbers” that we had done. He saw it and didn’t reply for a while, but then he got back to us and said ‘guys that was actually very good. It’s a groovy riff’. He dissected it for it us and it showed he really listened to it. Then later he was getting rid of some of his old guitars and he asked Ryan if he was interested in one (later used by Ryan in the video for “In Our Blood”). The relationship just blossomed from there. Ryan and Kane just clicked and loved talking about guitars and guitar tech stuff that I couldn’t really contribute to. They found they had a similar passion for music. I believe that Kane missed the music scene – after the early 90’s he went on to do his own thing; he did video game production and stuff for movies. I think seeing a younger band like us playing music he would have listened to just made it click. Whenever we asked him to play on the track we did expect him to say ‘thanks for the offer, but no’, so when he said yes we thought that was great. We were over the moon that it came together. It was personalities that meshed I think. NI ROCKS – “Asylum” is the first single from the new album and we’re going to play it now. Tell us about that track and why you decided to release if first? DAVID - We had brought “Asylum” on the road with us on The Poodles tour. We thought no-one knows us anyway, so if we play demo versions of new songs no-one is going to notice. We thought it was a good way to gauge audience reaction. We just started playing it with the original working title and the lyrics didn’t make a lot of sense, it was just a song to test peoples like for the groove. We’d wanted to write a hard rock swagger song that maybe had a bit of a dark feel to it. A bit less Poison and more of a Firehouse “All She Wrote” kinda vibe but darker. It just evolved that way. We thought it would be a good choice for the first single. Whenever Ryan wrote the song we thought that would suit Kane Roberts style of soloing; he has a very distinctive style of soloing and it lends itself to that song. When we decided to have Kane on “Asylum” the song started to flesh out a little more. Jakob was originally meant to sing on “Forever” and we thought that would suit because it’s a Euro-Rock type of song. But then I sent Jakob the lyrics and he said ‘I’m not sure what way you’ve been writing this, but I don’t think that is going to work’. I asked why not and he said read the lyrics; and it would have sounded like we were singing a love song to each other. So he couldn’t sing on “Forever” and we went through the track listing to see which would lend itself to two vocalists. “Asylum” was a song we loved, but with just me on vocals it didn’t have the same impact we were hoping for. So we thought Jakob would like that one and he ran with it. The whole outro section where we trade off the two of us was all his idea and he contributed big-time to the arrangement of the song. It was the logical first single. There are a couple of songs we want to release eventually – more catchy popy ones and we thought all the Maverick fans would want a hard-hitting rock song first. And it really helps that the two special guests are both on it, making it the logical choice. NI ROCKS –A video has just been released for “Asylum”. What can you tell us about that? DAVID – On the previous videos we went for the whole production value thing and tried to make it look pretty slick. Looking back at those videos, they do look nice and have a quality to them, but we didn’t feel our personality as a band was expressed adequately. I was watching the video for the Talisman song called “Mysterious”, which ironically Jakob Samuel plays drums on, as he was in Talisman at the time. It was kinda like a mesh compilation of them in the studio having a laugh and singing together. I thought we don’t have a video like that – one that shows our personalities. We actually had some footage from the tour in Berlin that we’d never used and we thought it was great and that we’d use it. We decided to do a live / studio / practice room mash-up to get across our personalities. Whenever we put the footage together we thought that it was great. Whenever Jakob was over we said do you mind us recording you in case we make this into a video and he said by all means, so it worked out well. When John Connor from Selene edited for us we didn’t have a clue what to expect. So when he sent it over we thought it was great. Of course we’d hassled Kane to get a solo recorded – Ryan had asked him to get someone record him doing the solo as we wanted him in the video. Once again Kane was a gentleman and was very obliging. NI ROCKS – Looking back to when Maverick got started in 2012 I believe. How did the original members of Maverick get together? DAVID – Maverick as it begun was myself, my brother and Chris Van Engelen essentially. We were the three that started it and we had a bit of a revolving door membership at the start. It was essentially three guys who got together and cover songs that they loved. I was actually the drummer of Maverick at the start before we got a drummer and I wasn’t even the singer. We had a revolving door of vocalists to try out, and perhaps at the time we were asking too much of them, although we don’t realise it. ‘Can you not sound a bit more like David Coverdale or Sebastian Bach?’ Now, looking back that’s not really a fair thing. I was behind the kit and I couldn’t really sing then. I had a natural range and found myself behind the kit telling them how to sing. My brother suggested that I was as good as they were and that I should sing, but I wasn’t sure I could do that. We really wanted Mike Ross to play drums as he’s an all round great musician. He actually played rhythm guitar on “Big Red” as well as on “Quid” along with my brother. We were hassling him to join and when he did I started to sing. In the early days of Maverick , truthfully I think I had a naturally ok voice, I just didn’t have a clue how to use it. It took a while and I’m getting there, but looking back at some of those live videos I’m thinking “oh God!” (laughs). Someone please take them down. Then again, it’s all building blocks, if you know what I mean. You have to start off not so good. We went from covering songs to writing our own ones. NI ROCKS – You’ve touched on my next two questions slightly. Had you a firm idea of the kind of sound that you wanted from the band? What bands were you main influences? DAVID – At the start we were just focused on later 80’s rock as we loved it so much. We loved the riffs and the groove. We did draw very closely from our influences, bands like Skid Row. I don’t think we had a clue what we wanted to sound like. Back then if you asked us what we wanted to sound like we’d have said “Slave to the Grind” Skid Row era would be good; but we just didn’t have the chops to pull that off back then (laughs). We knew we always wanted to be a hard rock band, we just weren’t sure which direction we wanted to go. Our influences over all would be everything from Whitesnake to Skid Row, Tyketto and all sorts of bands and we’re just trying to take our favourite bits from all those bands and mesh it into one sound. 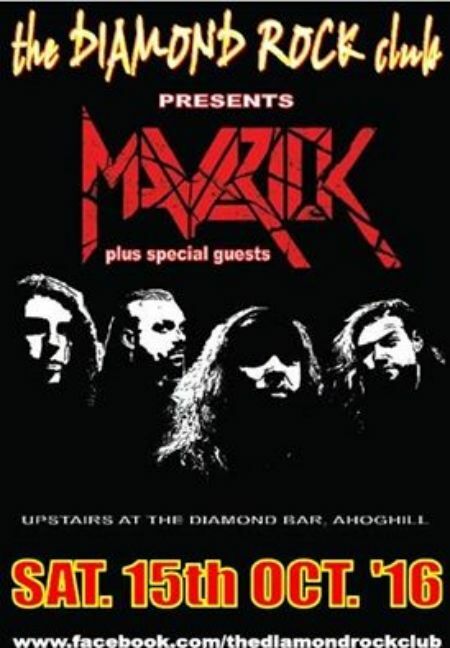 NI ROCKS – It was April 2013 before I caught Maverick playing live - in The Empire, playing an SO:NI show I think along with The Red Velvetines, Screaming Eagles and Sweet Taste. DAVID – Yeah I remember that gig. We were really nervous at that time. At the start of the gig Richie’s bass was just a wee bit out of tune and I always listen, especially live, to bass for my key because you almost feel it inside you. I remember just thinking try our best, but we were thrown into the deep end a bit – in a good way – and were very grateful for it. Being surrounded by bands of the calibre of Screaming Eagles and Sweet Taste who were more seasoned; or seasoned musicians at least. We’d been around a bit, but things like that made us what we were. Being surrounded by such great bands was an excellent learning experience. NI ROCKS - You supported Million Dollar Reload then about a week later in The Diamond Rock Club. DAVID – That was a really, really fun gig for us. Once again, we were really quite nervous about it. When you surround yourself with great bands it shows you all the things that you’re doing wrong. You watch the things they’re doing and learn from them naturally. Phil Conalane (Million Dollar Reload / Blackwater Conspiracy) has been good to us in terms of giving advice. The Diamond is such a great venue. Being surrounded by great bands and great fans is the best way to nurture any band. NI ROCKS – The “Talk’s Cheap” EP was released back in 2013 and helped build your local fanbase. Where had that been recorded and what were your biggest learning points from self releasing that EP? DAVID – It was recorded at Railway Studios with Ross Cullen, It was our first ever experience of doing anything like that. We threw ourselves in at the deep end – it was a great experience because it showed us the level of ability you need to have and the level of effort you need to put in to get the best result. A lot of those songs, whilst they’re good songs and a couple have stayed in the set, they were naively written. Though at the same time they did have a raw energy and it’s always good to have that. I think we learnt how to become a more professional outfit in the studio and it braced us for the Manor Park experience. Neal Calderwood’s personality just meshes with ours, in terms of what we expect from the music. He’s a perfectionist and there were times I’d sing a particularly high passage and it was alright, but deep down I’d know I could have done it better, and Neal Calderwood is the guy who’d say do it again! At the time you might feel like crying, but you’re glad he said it. The “Talk’s Cheap” experience was a good segue into that. NI ROCKS – As we mentioned earlier, the debut album “Quid Pro Quo” was released in 2014. What were your own personal favourites from that album and is there any track that you’d like to do differently now if you were going to re-record it? DAVID – That’s a good question! My personal favourite tracks on that album would be “Paint By Numbers” which stands up pretty well and “Got It Bad” is a good song. “In Our Blood” I really like now, but at the time we weren’t going to release as a single. Then we played it before Y&T because it was the new song that was the most ready and people really liked it. You can always tell by people’s faces that they enjoyed. I thought those three were very good and I think “Snakeskin Sinner” isn’t a bad song. If we had one song we’d want to re-record differently it’d definitely be “Rock n Roll Lady”. It has a good riff and a good chorus, but the way we perform it live now is probably about 10bpm faster and I sing it a lot more aggressively now. There’s a lot more fire to it live. I still think it’s a good song, but listening to it I think it’s lacking that fire and energy; so I’d love a chance to re-record that one day and perhaps make the most out of it. NI ROCKS – We’ll play another track from the new album now. Can you pick one you want us to play and maybe tell us a little bit about it? DAVID – Yeah, we’ll go for “Beyond The Gates” which I think, compared to “Quid Pro Quo”, is the most interesting song as I don’t think a lot of people will expect it. My brother and I were on a big Queensryche binge at the time and also listening to a bit of Iron Maiden, so we thought let’s try our hand at writing a rock song with flavours of that kind of stuff in it. It was a big challenge for me vocally, but I think the hours spent in the recording studio made me a better singer. If anyone has seen the movie “Enemy At The Gates” with Ed Harris and Jude Law, I know Davy Warren is a big fan; “Beyond The Gates” is about those two snipers. NI ROCKS – The new album is released on 26th August and the official launch is the following day in The Limelight in Belfast. Have you anything special planned for that show? DAVID – Probably our favourite band on the island, if we were held at gunpoint to choose one, would be Stereo Nasty. A combination of a very simple aggressive, melodic metal style with a lot of rock flavours. There’s a lot of W.A.S.P. in it and I knew when I first met the guys that they had such a way about them – pleasant and professional – and they’re also very 80’s to the core, in a good way. They were a logical choice for us and I know a lot of our fans think very highly of them. So they’re making the effort to come up from Kildare. We’re going to be playing every single track from “Big Red” but we’ll not be playing it in order, simply because there are a couple of songs toward the end that are quite hard to sing and I want to make sure I get them out of the way early (laughs). So we’ll be playing all the tracks from “Big Red” and we’ll also be playing a surprise cover which I don’t think anyone will see coming and it’ll be an interesting one (see video below for "Get The Funk Out"). There will also be a couple of favourites from “Quid Pro Quo” and we might have a wee surprise up our sleeve too. It’ll be a great gig and hopefully everyone can come down. NI ROCKS – Are there any plans to release the album on vinyl? DAVID - Eddy Freiberger is a big fan of vinyl and so are we. If it wasn’t for the fact that our vinyl player is broken it’d still be my favourite format. It’ll not be on the initial run, we’ll have to save a little bit of money for the vinyl run. After the launch when we sell a few albums we’ll maybe put that money back in and get some vinyl made. I know there are a lot of people who are fans of ours who would really want vinyl. Growing up as a kid and being fed a steady diet of Van Halen and Alice Cooper on vinyl by my dad, it is a dream to have one of our albums on vinyl. Fingers crossed, before Christmas we’ll get that done. NI ROCKS – What else have Maverick got coming up over the next few months? DAVID – Over the next couple of months we’ve a project in the pipeline with Kane Roberts – I can’t really confirm details, but it’ll be a combination of gigs and working together on some stuff. What we’re trying to do now is secure another European tour to help back “Big Red”. There are a few bands that we’re chatting with and fingers crossed that’ll be the next thing on the horizon for us. As with all these things, until you see it in black and white you can’t rest on your laurels. We’ll be in Germany in October and hopefully we’ll get a few shows either side of the H.E.A.T. festival which is a great line-up. That’s the kind of line-up that I’d travel across country to see, never mind playing in it. NI ROCKS – Kane is playing that as well isn’t he? DAVID – He is indeed, we’re actually going to be his band which is great. A lot of bands are doing that these days. When Phil Lewis came to the Diamond there was a band (Nitehawks) that backed him and supported. Kane offered us the chance to do it and to be honest, my brother and I are massive fans so it was like kids in a candy shop! So it’ll be absolutely massive for us. He asked me if I wanted to sing the Alice Cooper songs – he didn’t need to ask twice (laughs). It’ll be great for Maverick because there will be more people coming out to see him and maybe the ones that recognise us from earlier in the night might say to people beside them. It’ll be good for us and it’s a bucket list box ticker too. (Update - Unfortunately Kane has announced that he is pulling out of the H.E.A.T. festival due to recording commitments). NI ROCKS – The band has been going for about four years now; what have been your own personal highlights fronting Maverick? DAVID – Locally, we did a show in The Diamond Rock Club, just before the tour I think and we were worried about the turn-out for one reason or another, I can’t remember why, they might have been other good gigs on with quality bands. It was my girlfriend Shonagh Lyons (lead singer for Selene) first time seeing us too. We went out and the place was really full and we thought thank god for that! That night we had a cover of “Still of the Night” by Whitesnake to do, which I was personally worried about (laughs) for various reasons. But it all went off without a hitch. The Diamond is such a great place and anytime we play there it’s really important to put on a great show. That was a highlight for me. And also, the first time seeing the tour bus. We were sitting in the Ibis with all our luggage and gear around us waiting for the tour bus to arrive. Then this absolute goliath comes round the corner and it was like oh my god this is actually happening (laughs). And to be honest getting signed to Massacre and then Metalapolis was great. I knowing being signed to a label is not the same as it was in the 80’s or 90’s but the fact that people are willing to gamble their money on you is a massive compliment. There have been a few highlights! NI ROCKS – If we were to be talking this time next year, what would you hope to have accomplished over the past year? DAVID – I do hope that by this time next year we’ll have had a good go at the festival circuit. If we played the big festivals, fantastic, but even the medium tier festivals would be excellent. I personally believe we’re well worth it in terms of quality and think we’re well able for it. I just think there are a lot of great bands about and we’d like to get to know some of the people in those bands and perhaps get future collaborations and tours. Getting into Hard Rock Hell or Steelhouse on the early stage, warming people up for the big acts and also as a fan of those big acts I’d just like to say we’d shared a stage with them. I’d also love to have a European tour under our belts by this time next year, maybe even a more extensive one. NI ROCKS – A quick couple of questions to finish with. First album you remember buying and the last one you bought? DAVID – The first album I ever bought was an Iron Maiden compilation, I think it was called “The Best of The Beast”. My friend had lent me “Fear of the Dark”. I’d grown up listening to Van Halen, Alice Cooper and Rory Gallagher from my father, but Iron Maiden were that bit heavier, without being overly heavy. The first time I heard them, it was like, oh my god this is Van Halen on steroids. It was a great feeling. The last album that I bought was Baton Rouge’s second album, which I got at quite a good price. It’s not quite as good as the first album but I’m quite a fan of them and the first album “Shake Your Soul” is a fantastic album. I think they were a bit unlucky not to do a bit better. I’m a sucker for slightly obscure 80’s rock but the problem is that sometimes they cost quite a bit! NI ROCKS – First gig that you went to and the last? DAVID – First ever gig I went to was Iron Maiden down in the Point Theatre in Dublin in 2001 I think it was. It was a baptism by fire. I’d a lot of chances to go to small local shows but I was very young and truthfully was afraid to go to a gig; that sounds ridiculous. I’d rather watch my music DVDs. But when Iron Maiden came it was a case of I can’t say no. So my brother and myself and my friends Andy and Peter went down. To say we were blown away would be an understatement. We’d never felt what a bass drum sounded like in person – like a very specific bang where you can feel it in the rib cage (laughs). The last gig that I went to was Danny Vaughn (in the Diamond Rock Club), you were there too – he’s great. There are some guys with those acoustic shows that have a very good, but rehearsed, sense of humour and there’s nothing wrong with that, but Danny has a very distinctive, off-the-cuff, genuine way with him. He’s open and talks about some very personal stuff. I really appreciate someone who wears their heart on their sleeve like that. Obviously on a musical level, the guys voice has not aged. I don’t know how the hell he has managed it, but his voice is as good as it was in the late 80’s and early 90’s and it’s phenomenal that he has done that. That was one of my favourite gigs that I’ve seen recently. Hopefully next time he comes back it’ll be with Tyketto again. NI ROCKS – If you had the chance to front any band – past or present (as in “Rock Star” or with Journey / Judas Priest) – which would it be and why? DAVID – To be honest with you, and I’m not suggesting for one second that I would be remotely able to fill the boots of said person, but I would have loved to have been around singing David Lee Roth era Van Halen. I think there was a hot-bed of music at the time and rock music was taking off. To look round and see Eddie Van Halen on your left and Michael Anthony on your right! I can’t even put into words how great that would be. I’d have to make sure that I didn’t hit all the drugs and go off the wagon leading to Van Hagar coming around, as much as love them! (laughs). NI ROCKS – Thanks for taking the time to talk to Rock Radio NI. Best of luck with the new album. We’ll finish with another track from it now. Which one would you like to play and tell us a little bit about it. DAVID - We’ll go with “Forever” next. It was a riff that I came up with and then hummed it to Ryan. A lot of our music comes around like that. I don’t play any musical instruments at all, apart from drums, but I can a cappella the riffs to him. He just rolls his eyes because it takes time to figure them out. I remember I hummed him that riff and he thought it was quite good. One of my favourite films of all time is ‘Highlander’ with Christopher Lambert and I was watching it one night and thought I really want to write a song about that! The lyrics are about an immortal guy who maybe doesn’t know that he is immortal and watches his wife or love his life die and is essentially very lonely after that.